Venice is considered one of the world’s most beautiful and romantic cities. Its canals and streets remain the same as they were hundreds of years ago. For Jews, however, Venice is also a place with a dark history; it is where the world’s first ghetto was instituted and the quality of Jewish life often shifted with the whims of the ruling power. While Jews did not settle in Venice until the 13th century, many Jewish merchants and moneylenders visited and worked in the city beginning with the 10th century. Jews were mentioned in documents in 945 and 992 forbidding Venetian captains from accepting Jews onboard their ships. In 1252, Jews were not allowed to settle in the main part of the city, so they settled on the island of Spinaulunga (also spelled Spinalonga) which later became Giudecca. The Senate decided to expel the Jews from the city in 1394 due to fears of Jewish encroachment in certain economic spheres. They were allowed to work in the city for limited two-week intervals. Those who were not moneylenders were allowed to remain in the city, albeit with certain restrictions. Jews were forced to wear various markings on their clothing to identify themselves as Jews. In 1394 they had to wear a yellow badge, it was changed to a yellow hat in 1496 and to a red hat in 1500. Other anti-Jewish laws including the prohibition against owning land (enacted in 1423) and from building a synagogue (enacted in 1426). On occasion, Jews were forced to attend Christian services or become baptized. Anti-Jewish feelings were prevalent and three Jews died in a blood libel in 1480 and more died after another libel in 1506. Despite the harsh economic hardships, Jewish culture was allowed to develop to a certain degree. Daniel Bomber, known as Aldo Manuzio (1449-1515), the first Italian printer, used Hebrew fonts in his publications. This marked an increased open-mindedness toward Jewish culture among Venetian and Italian intellectuals. Venice received an influx of immigrants from Spain and Portugal following the expulsion in 1492. Isaac Abravanel was one of the well-known Sephardic immigrants who came during this period. Jews of Italian and German origin moved into this ghetto. The latter came to Venice because of persecution in their communities, while the former came from Rome and from the South, where they faced anti-Semitism. Jews from the Levant, who practiced Sephardic traditions, moved into Ghetto Vecchio in 1541. The Spanish and Portuguese Jews also came to Venice in the late 16th century and were the strongest and wealthiest community in the ghetto. Many of the Spanish and Portuguese Jews were Marranos and became “Jewish” again once moving to Venice. 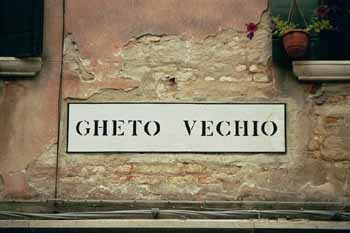 The Spanish/Portuguese and Levantines lived in the Ghetto Vecchio. The German, Italian and Levantine communities were independent, yet lived side by side to one another. A hierarchy existed among them, in which the Sephardic (Spanish and Portuguese)/Levantine Jews were at the top of the scale, Germans in the middle and Italians at the lowest rung. Further restrictions were placed on Jews living in the ghetto. They were only allowed to leave during the day and were locked inside at night. Jews were only permitted to work at pawn shops, act as money lenders, work the Hebrew printing press, trade in textiles or practice medicine. Detailed banking laws kept their interest rates low and made life difficult for many of the poor pawnbrokers and moneylenders. Once they left the ghetto they still had to wear distinguishing clothing, such as a yellow circle or scarf. Jews were faced with high taxes and the Talmud was burned in 1553, due to arguments between two Venetian printing companies. Hebrew books were not allowed to printed for the next thirteen years, however, the Jewish printing press and publishing companies continued to thrive until the early 19th century. One period that was particularly difficult for Venetian Jews was during the 1570's, after the Battle of Lepanto in 1571. The Jews were blamed for the war and expulsion threats were made. The German and Italian Jews survived the war by making financial concessions. They decreased their interest rate to five percent per annum, the price they had to pay for stable residence in the ghetto. This was a major setback, however, the Jews were able to recover. Despite the poor living conditions, Jewish community life continued to grow inside the ghetto. Life centered around Jewish ritual and customs and the celebration of the Sabbath. The Ashkenazic Jews built two synagogues on the top floors of the ghetto building, the Scola Grande Tedesca in 1528-29 and the Scola Canton in 1531. The Levantine Jews, who had more money, built an extravagant synagogue in 1575 and it was housed in its own building in Ghetto Vecchio. The Spanish Jews built a synagogue in 1584. Jews were also able to build their own free school, the only one in Venice. Christians came to the ghetto to visit Jewish banks, doctors or shop for spices, jewelry and fabrics. In this period, Venice was home to many famous physicians who later served the Queen of France, the royal Court in Spain and figures such as Pope Paul III. Famous personalities included, Rabbi Simone Luzzato, who served as Venice’s rabbi for 50 years. Luzzato published the Discorso circa il stato defl’Hebrei (Discourse on the State of the Jews), which examined the social and political conditions of Jews in a non-Jewish environment. A third famous personality was Sara Coppio Sullam, who was the ghetto’s leading poets, she held a salon that drew many educated men and aristocrats. 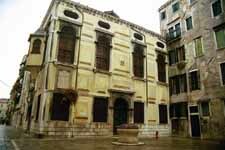 Venice was the center for Jewish knowledge and learning for many Sephardic Jews. Venetian Sephardic scholars traveled from Venice to start new communities in London and Amsterdam. Venice also served as a center for Kabbalah in the early 18th century. One of the community’s most influential Kabbalists was Rabbi Mosheh Zacuto, who was active from 1645-1673. The economic conditions for Jews deteriorated at the end of the 17th century. 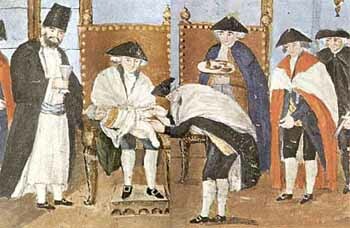 Anti-Jewish feelings were prevalent in the 18th century and limitations were placed on Jewish economic activity. The Jewish population decreased from 4,800 in 1655 to 1,700 in 1766 because many prominent families left for Leghorn or other port cities. Taxes were extremely stiff and Jewish ship owners and merchants lost their shops between 1714-1718. Finally in 1737, the Jewish community had to declare bankruptcy. In February 2016 Venice marked the 500th anniversary of the establishment of the world's first Jewish Ghetto, kicking off a year-long commemoration including keynote speakers, concerts, exhibitions on Jewish life in Venice, workshops, art installations, conferences, and more. The celebration will also include the first ever performance to take place in the ghetto of William Shakespeare's “the Merchant of Venice,” featuring U.S. Supreme Court Justice Ruth Bader Ginsburg presiding over the mock trial within the play. In 1848-49, there was a short-lived Venetian Republic run by Daniele Manin, who had Jewish origins. After Italy’s unification, in 1866, Venetian Jewry achieved an equal status. One famous Venetian Jew, Luigi Luzzati, began his career in politics organizing an aid society for gondoliers. He continued to serve in the Italian Parliament for 50 years and was elected Italy’s first Jewish Prime Minister in 1910. Following World War I, many Jews left the city because of rising tensions. Jews did not face restrictions in the early years of Mussolini’s rule, but the situation changed in the 1930's because of Italy’s relationship with Germany. About 1,200 Jews were living in Venice when German troops occupied the city in 1943. Between November 9, 1943 and August 17,1944, 205 people were deported to extermination camps, including Chief Rabbi Adolfo Ottolenghi. At the end of World War II, 1,500 Jews were living in Venice and the number gradually decreased over the years. By 1965, 844 Jews remained in Venice. Today Venice has a Jewish population of about 500 peoples, only 30 of them live in the former ghetto. The ghetto houses all of the city’s major Jewish institutions. The community is officially Orthodox. Jews are prominent in business and as doctors, but no longer are involved in the banking industry. Venice is the only Italian city where one can find an intact ghetto that has remained unchanged since its founding. The site is so prominent in the city’s history that there is a water taxi stop that lists the ghetto (in Italian and Hebrew) as one of the nearby sites and, at night, a neon sign with Hebrew letters is turned on above the dock. Venice has five synagogues, a Jewish bookstore, a Jewish publishing house, a social center, a rest home, a museum, a yeshiva and a kosher restaurant. The ghetto consists of an open square surrounded by “skyscrapers” on three sides. Because of the lack of space in the ghetto, many six-story “skyscrapers” were built. Laws forbid building separate synagogues, hence the synagogues were built on the top floors of the buildings because there should be no obstructions between the congregation and the heavens. The museum contains Jewish ritual objects that were made or used in Venice, such as Seder plates and spice boxes. Three of the ghetto’s five synagogues come under the auspice of the Jewish Museum. The first of these is the Tedesca or German synagogue, located to the left of the Museum. The oldest synagogue in the ghetto, built in 1528, it can be found on the fifth floor of the building. It was restored in 1848, 1860, 1910 and in 1975. The synagogue’s service room houses the Museum of Hebrew Art. On the right side of the Museum is the Canton Synagogue, which was built in 1531. This synagogue served as the center for Jews from Germany, France and Switzerland. One can fine a beautiful ark with carved and gilded doors. It has been restored and altered a number of times and is still in use today for wedding ceremonies. 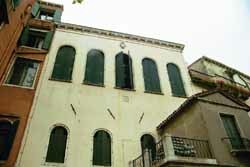 The Italian synagogue, built in 1575, served the Italians, the poorest group in the ghetto. The synagogue is quite simple reflecting its status among the communities. It was restored to its original appearance in 1970. The Jewish home for the aged-Casa di Riposo Israelitica houses only ten people, but the building is increasingly used by the community to welcome travelers and to provide kosher meals. 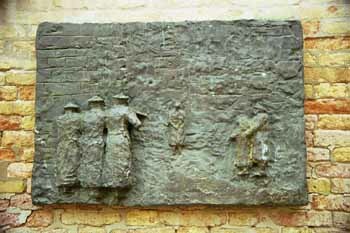 On both sides of the Casa di Riposa building are Holocaust memorials designed by sculptor Arbit Blatas. The Nazis gathered Jews for deportation in the square. One of the monuments is a bronze panel depicting the Last Train, the other monument has bronze reliefs that show the Nazi brutality against the Jews. In the ghetto, there is also a kosher grocery store, run by Chabad, as well as a kosher restaurant. The Levantine Synagogue, which is a two-story yellow stone building, catered to the Jews of Middle East descent. Inside the sanctuary are two dozen hanging lamps and an ornate wooden bima. It was built in the late 16th Century. Today it is used for prayer services from the period after the High Holy Days until Passover. In the alleyways facing the Levantine synagogue, one can find the Calle del Forna, where there is an oven that is still used today for making Matzah. One can also find, in this section of the ghetto, the bet midrash (study house) of Leon da Modena and the Midrash Vivante, which was founded in 1853. There is not much left of this section of the Venetian ghetto, besides a few mezuzah indentations found on the doorposts of some of the buildings. 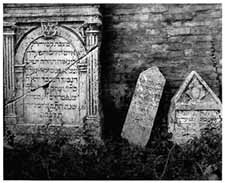 The land for the Jewish cemetery at the Lido di Venezia was given to the Jews in 1386. One can find the grave of Rabbi Leon da Modena, as well as Sarah Sullam. A new cemetery was opened in the 1800's in the adjacent area. On the graves from this period, one can find portraits of the deceased. Other sites of Jewish interest in Venice include a stone with an engraved Star of David found in St. Mark’s Cathedral. According to legend, the stone was brought to Venice from the Temple in Jerusalem. Above the stone is a mosaic of Moses. Mosaics of King Solomon, Joseph and Abraham can also be found in the cathedral. In the Palace of the Doges, next to Saint Mark’s, there are statues of King Solomon and other biblical figures. The Ghetto of the Lagoon: A guide to the history and art of the Venetian Ghetto. Translated by Roberto Matteoda. 1987-2000. Photo credits: Lido cemetery photos copyright © PhotoArts, photos of medieval Jews, “milah,” menorah and inside of Canton Synagogue copyright © Jews and Synagogues. EdizioniStorti Venezia. 1999, the remainder copyright © Mitchell Bard.